I have, for years now, I have been trying to figure out if I have a gluten intolerance or not. It’s been quite a battle that, if I had better health insurance, could have been solved a looooooot sooner. And, it figures that by the time I get good insurance, I’ve pretty much figure it out on my own. I don’t have a full blown intolerance, I’ve got a slight one. Luckily, as a clean eater, it’s easy to steer around gluten filled foods. My first foray into gluten free was Van’s Waffles. I can’t remember the first “flavor” I got, but they were disgusting. Nowhere near as good as my Eggo or homemade waffles. I was bummed out, bad. I eventually tried and got hooked on the Van’s blueberry waffles with homemade applesauce on them. Delicious. The hardest was pizza. I’ve browsed all around the internet, cookbooks and cooking magazines for a gluten free pizza dough recipe. Lots of trial, and lots of error. It sucked. I inevitably gave up pizza for a whole year. My stomach and GI just hated me afterwards. Then, a week ago I was at the market stand that I buy my produce and other “good for you” goodies from and came across a second chance at pizza. I’ve bought many of Bob’s Red Mill products before and most, I enjoy and make a repeat trip to buy. So I figured, what the heck, why not try this? My kitchen smelled amazing while I was cooking it in prep for toppings. After two bites, I knew that I could definitely add pizza back to the menu. The ingredients are pretty basic: Brown rice flour, potato starch, millet flour, sorghum flour, tapioca flour, potato flour, evaporated cane juice, xanthan gum, active fry yeast sea salt, and guar gum. All you need is olive oil, two eggs, water and almond flour (to dust your pizza stone). You combine the water and yeast, then let stand for about five minutes. Then, add eggs and oil, blend briefly. Add the mix and, here’s the tricky part — blend on medium speed for about one minute. If you have a hand mixer like me, hold on tight. The dough will bind all up in the mixing spoons and it will take a bit of elbow grease to get it out. Split the dough in half and let rest for 20 minutes. Using wet hands spread out dough on prepared pizza pans. Bake 7-9 minutes. Top and then bake an additional 15-18 minutes. Just a bit of advice, if you don’t like heavy crust, make it really thin. First time around, I made it like a regular pan pizza style and it was pretty heavy. One piece and I felt full. Next time, I plan to make it much thinner. 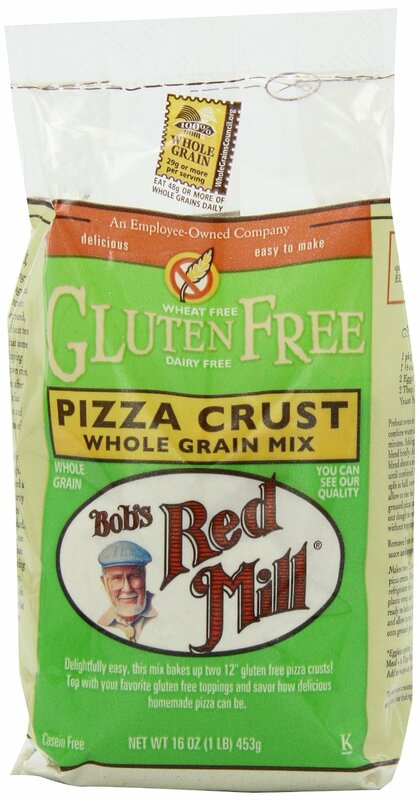 If you can’t find Bob’s Red Mill pizza crust in your local market or store, you can find it here, at Amazon.